Thus far, the club is still using the improvised speech timing cards that I made, but with a Demo Meeting coming up which our club is sponsoring, I wanted something more impressive. 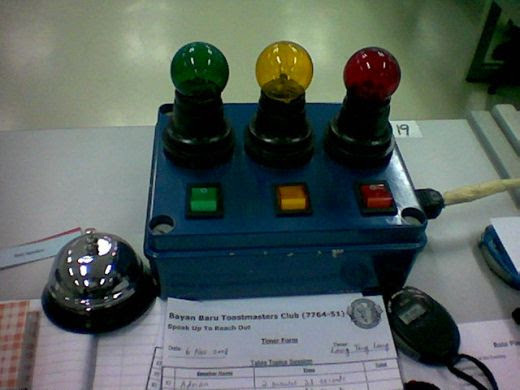 The old Toastmasters Signal Lights that was assembled for me is still gathering dust in a corner. I don't think I may be able to have it repaired anytime soon. Then I thought, does a timing lights device really need to be built from scratch, just like the one that I requested to be assembled? 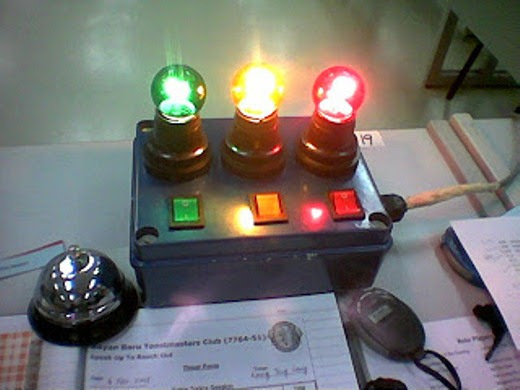 It's google search time once again and here's one I saw from the Bayan Baru Toastmasters Club. The above timing device looks rock-solid and sturdy. It has incandescent bulbs and by the look of the cable at the right, you'll know it is A/C powered. The switches are even color-coded to match the lamps' color. But there are three individual switches. That means the lamps are really independently lighted. Hence, all three lamps could be lighted at the same time and the photo below confirmed that. I've not confirmed but it seems the above model was also assembled probably by an electrician or electrical hobbyist. The matching switches shows it's customized. However, the above photo gave me an idea of putting together electrical parts that are readily available from the hardware section. But putting together means no special fastening of electrical parts and no soldering. The three independent switches on the box was the clue. Nowadays, there are some extension cords that have independent switches for the outlets. Some have up to six outlets and some even have pilot or indicator lights for the switches. The rest of the parts can be put together with no soldering, taping or rewiring also. So here are the electrical parts of the Timing Lights Device that you could easily buy from a hardware or electrical supplies store. 3-Outlet Extension Cord (Power Strip) - 1 pc. Although there are extension cord housings that have 4 to 6 outlets, you should get the one with just 3 outlets for the 3 lamps. The more outlets, the bigger or longer the housing will be and therefore the bulkier the timing device. Extension cords complete with individual switches such as this would typically have a higher rating. This one is rated at 10 Amperes. The power cord is 3 meters long and is adequate for most situations. The outlets receive either 2-prong or 3-prong (with grounding) plugs. Adaptor Plug - 1 pc. This is an optional item. Choose one as applicable for your location. I had to get one because the plug of my extension cord had 3-prongs and many establishments here only accept the 2-prong plugs. Ping-pong Type Incandescent Bulbs - 3 pcs. The incandescent bulbs are of the E27 type which is the screw base for regular bulbs for A/C. Get 1 green, 1 yellow and 1 red for a single set. I bought another set for backup. The reason is because Incandescent lamps are slowly being phased out in favor of the newer LED bulbs. I just feel that the glow of incandescents is much more intense than the LED bulbs. Socket Plug for E27 bulbs - 3 pcs. These are the plugs with the built-in sockets. As far as I know, these socket plugs are available with the 2-prongs only. That's a total cost of Php 637 or roughly US$ 13.